Set of 2 model 310 armchairs designed by Erik Buch and made in Denmark by Christiansen Møbelfabrik. Frames constructed in solid teak with bent-laminated teak backrests and seats upholstered in a green-beige pebbled leatherette. 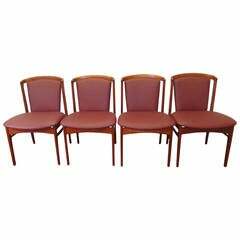 4 side chairs from this set are also available. 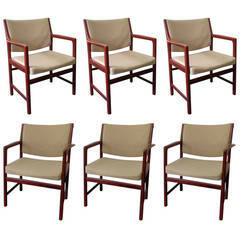 Set of six teak armchairs by Karl Erik Ekselius with original upholstery. Teak dining chairs by Erik Buch reupholstered in leather.